That sounds melodramatic, doesn’t it? I know. I think so too. And gosh, I hate drama. For the past 24 hours, I’ve struggled with what happened yesterday, and I’ve worried that I was being overemotional for no good reason, that I was being histrionic. The answer is no. I could have died, but I didn’t. Last night, to calm myself, I made homemade ricotta cheese. I felt the need to create something. I couldn’t create the words yet – the writer inside my head was mostly a crazed, screaming fool last night – so I stood at the stovetop and stirred milk and cream. But I’ll get to the ricotta in a bit. Let me tell you what happened. Yesterday morning, I met a woman from my work, Karen, at a local Starbucks. We had an appointment to visit a medical practice in a town about 40 minutes from here. I left my minivan in the parking lot and we climbed into her car, a company car. The morning’s appointment went well – I love getting to know the other physicians in our community – and we headed back before 11 o’clock. Clouds were gathering, and I told Karen I hoped we made it back before the rain let loose. Karen drove, and we made small talk, chatting about work or our children, and eventually we reached the flat stretch of Interstate 75 that crosses Paynes Prairie. We were in the far left lane, the fast lane, but Karen was driving right at the speed limit – 70 mph. Ominous clouds the color of slate converged on the horizon, stretching to the right and left. A bolt of lightning punched downward, into the trees, ahead of us and to our left. We both cringed. The lightning bolt seemed to stay on the ground much longer than normal – 10 seconds? 20 seconds? Half a minute later, another strike hit to our left, in the prairie itself, and a rumbling of thunder immediately followed. It still wasn’t raining, but the darkness ahead was closing in. “Should we pull over?” Karen asked me. She gripped the steering wheel and leaned over it, as if to concentrate harder on the road ahead. “No, just keep going,” I said. I just wanted to get through the storm, away from the lightning that seemed to all around us. I also wanted to be out of all of the traffic that had steadily picked up as we got closer to Gainesville. The three lanes of traffic were filled with cars, most of them speeding, and we were stuck in the far left. The next bolt of lightning struck directly in front of us, perhaps just 3 feet away, sparks and flames leaping up from the pavement in front of the car, bright whiteness blinding us momentarily. The bolt looked at least a foot wide. We screamed, the lightning reached out toward our car, and then we were inside the bolt. Karen never had time to brake, and in hindsight, that probably helped us survive. I grabbed her shoulder, both of us still screaming, but she kept her hands on the wheel, knuckles blanching white. The engine warning and indicator lights on the dashboard in front of Karen all came on, and then the car’s engine shut completely off. My memories of the moments inside the car while it was engulfed lightning are hazy. I recall that it was loud and bright. It was so incredibly bright, with a whiteness that seemed to fill the car’s space. After the lightning bolt lifted, finally, and after what seemed like minutes, I saw ghosts of the jagged lightning strike wherever I looked, as my retinas attempted to recover from the flash. Somehow Karen managed to maneuver the car – coasting, with no power – across three lanes of traffic and into a rest area on the northbound side of I-75. Somehow, we didn’t crash, didn’t cause a massive pileup like the one that happened last year in that same stretch of the interstate. The car’s electrical system must have been fried immediately by the lightning; the engine never would turn back on. I later learned that the windshield was cracked, the paint of the car was speckled with scratches and chips, the hood was dented in a few places, and a smoky coating covered the exterior. There were burn marks on the car over the passenger side door, at the level of my head. I did a lot of research yesterday afternoon and last night. I learned more than I wanted to know about lightning strikes, and about injuries – and deaths – related to lightning. I know we were protected from electrocution by the metal frame of the car – but not by the tires, that’s a myth – but I don’t know why we didn’t die on that interstate, driving 70 miles per hour in three lanes of traffic. We were lucky, amazingly lucky. As the kids and I settled in for the evening, before the storms came – the storms that knocked out our power right at bedtime – I made fresh ricotta. I packed it into an airtight container and set it in the refrigerator. 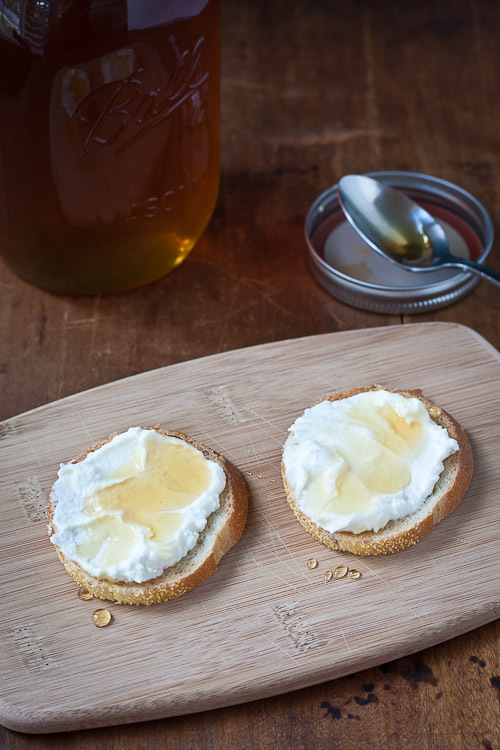 The kids and I would eat crostini with fresh homemade ricotta, drizzled with honey, for breakfast the next day. Later, when the power was out, I lay in bed in the quiet, warm stillness. I listened to the occasional growl of thunder and cringed at the sporadic flashes of lightning that brightened the bedroom. I thought of that ricotta on the second shelf of the refrigerator, and I hoped that the power would return soon so that it would not spoil. I thought of sharing that ricotta the next day, with my children, simply because I could. Because I had not died. 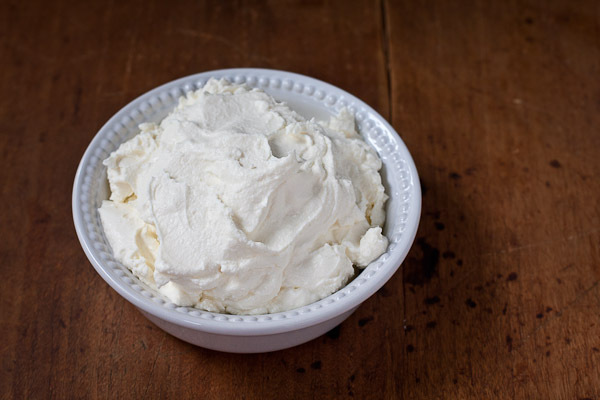 The basic formula for making ricotta cheese is this: milk plus heat plus acid. 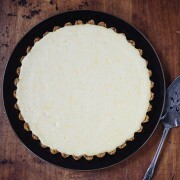 I used lemon juice, which gives the ricotta a distinctly lemony flavor. 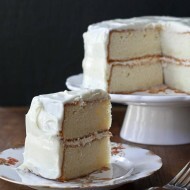 You could also use white vinegar for a more neutral flavor. Pour the milk and cream into a large nonreactive saucepan and stir in the salt. Heat the milk over high heat, stirring every few minutes to prevent scorching, until the milk reaches a temperature of 180-190 degrees. Remove from heat and slowly stir in lemon juice until you see curds forming. The curds may be small, but they'll be there. Let the saucepan sit undisturbed for 5 minutes or so. Line a colander with three layers of cheesecloth and place over a large bowl (which will catch the liquid). Pour the contents of the saucepan slowly into the cheesecloth-lined colander and let this sit for at least 1 hour. 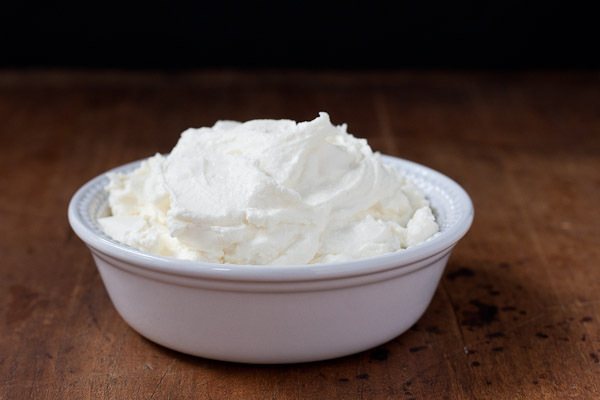 After one hour, the ricotta will be soft and spreadable, and if you let it sit for longer, the ricotta will be more firm as more whey drains out of it. I like to let mine sit for about 2 hours. 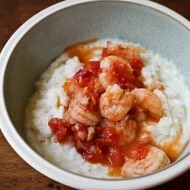 Use the ricotta right away, or transfer to an airtight container and store in the refrigerator.